I’ve always known I wanted to travel. Since I was young, exploring the pages of library books and dreaming of the world beyond my small town, I’ve only imagined what it must be like to adventure and discover the massive, beautiful world beyond my comfort zone. I found myself sick for want of travel, planning out fictional trips I knew I could never afford. It didn’t matter so much where I went, I just needed to go. I decided that this was the time. Instead of lying to myself and and promising that I’d travel “later,” or “when I grew up,” I decided to begin now. You could say I had pretty high expectations for travel, having rehearsed grand entrances to new worlds hundreds of times in my head my whole life. Like many others, I expected traveling to be a magic carpet ride followed by life being perfect for a week or two as you forget the world behind you. n reality it was much different- much more beautiful. It wasn’t a magical new world, it was a brand new everyday world. It was life- messy, beautiful life. I got to experience everyday life as seen through the eyes of a completely different culture, and expand my point of view beyond the boundaries of my comfort zone. That’s not to say it disappointed my expectations. There was certainly enough discovery and adventure to abundantly satisfy my dreams of traveling the world. 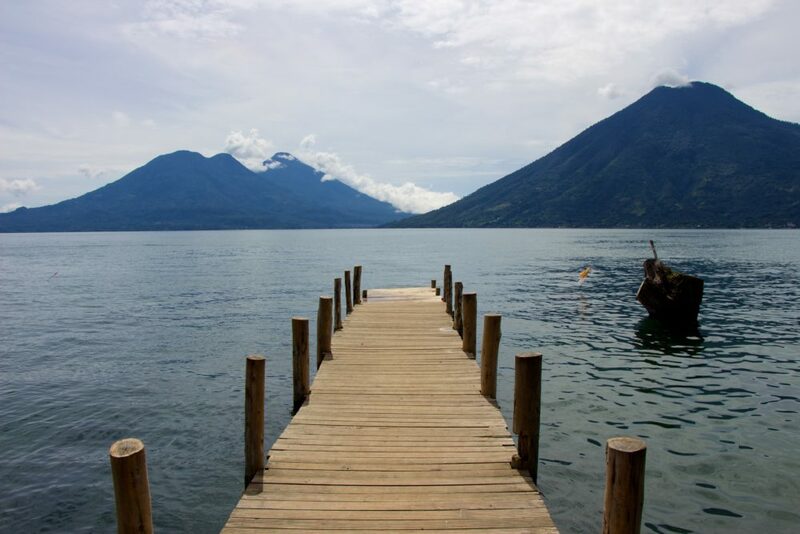 On top of the breathtaking view of Lake Atitlan, I regularly rode a chicken bus packed from wheel to roof with people, baggage, and the smell of corn tortillas. Or, holding to a single metal bar, I stood in the back of a pick-up truck as it drove through winding mountain roads. I hiked a volcano and saw what looked like the end of the world at its peak. I tried my hand at haggling (mostly unsuccessfully), ate new foods, and even spoke a new language. Yet through all the adventure, the unexpected happened. Even more meaningful than the scenery and more amazing than the Mexican Style pizza at Happy Taco, I value most the people I met, the stories I heard, and the resilience I saw rising above poverty and circumstance. 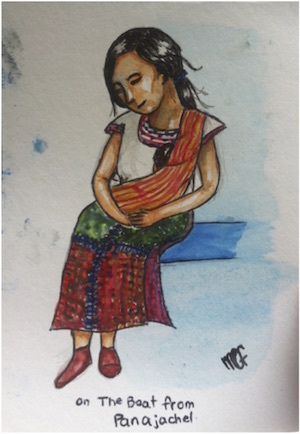 The Mayans of Guatemala daily survive what should be impossible circumstances, fighting past poverty, injustice, and inequality. This trip challenged me in many ways, bringing to light the hard questions and gray areas we often mask to avoid discomfort and disagreement. It challenged me physically, as our group hiked up the jagged trails to the top of Volcan San Pedro. It challenged me to be brave, and to be kind. It also inspired me for a future of travels and adventure. The last few days on Lake Atitlan I could only think, “Where will I go next, and how?” I learned hundreds of new things, and saw wisps of beauty and color everywhere I went. 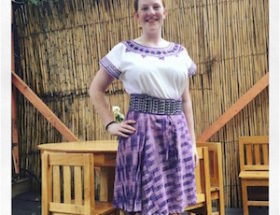 Maegan Flood is an 18 year old student who traveled to Guatemala with a group of 8 other girls for the purpose of education and adventure. This was her first international trip. She may, or may not, have gotten stuck in the Mexico City airport for an extra five hours of excitement. She has big goals, including creating a location independent design company (she already has her first paying clients!) and traveling much more. For her next trip, she’s got her sights set on Ireland. 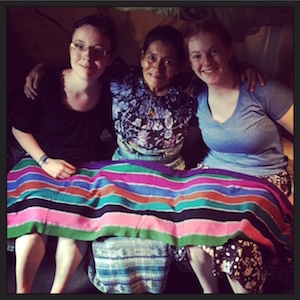 This entry was posted in blog, Traveler Stories and tagged Guatemala, Maegan Flood. Bookmark the permalink.